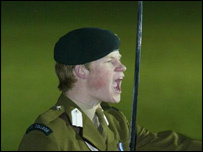 Prince Harry's decision to join the Army means he will follow a long family tradition of serving in the military. His uncle, Prince Andrew, joined the Navy in 1979 and, after gaining his Royal Marines green beret, went on to elementary flying training at RAF Leeming, Yorkshire. In April 1981, the prince was presented his wings by Prince Philip, and left with the aircraft carrier HMS Invincible on active service during the Falklands War. In 1997, after receiving various commendations from the forces, Prince Andrew was appointed to join the Ministry of Defence in London as a staff officer in the Directorate of Naval Operations. His service in the Armed Forces continued until July 2001. Prince Harry's other uncle, Prince Edward, had only a brief spell in the Armed Forces, joining the Royal Marines as a second lieutenant in 1983. The first member of the Royal Family to join the Marines, he did a two-week course at Lympstone before going to Jesus College, Cambridge, to read for history on a Marines-sponsored cadetship. He subsequently spent five weeks a year with the Marines, including a short tour in Belize. But the military life did not suit him and he eventually left in 1987 to work in theatre production for Andrew Lloyd-Webber's Really Useful Group. 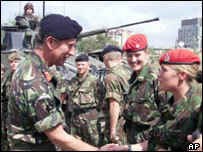 Prince Harry's father, the Prince of Wales, took up his first service appointment in 1969 as colonel-in-chief of the Royal Regiment of Wales. He became the colonel of the Welsh Guards in 1975, in succession to the Duke of Edinburgh, and now holds a number of service appointments. In the autumn of that year, the prince entered the Royal Navy. Following service on a guided-missile destroyer and two frigates, he qualified as a helicopter pilot in 1974 at the Royal Naval Air Station at Yeovilton in Somerset. Later, the prince joined 845 Naval Air Squadron on commando flying duties, operating from the aircraft carrier HMS Hermes. In early 1976 he took command of the coastal minehunter HMS Bronington. The prince left the Navy the same year. 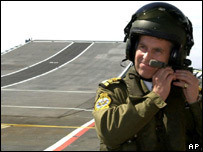 He currently holds the ceremonial ranks of rear-admiral in the Navy, major-general in the Army and air vice-marshal in the RAF. Harry's grandfather, the Duke of Edinburgh, had a distinguished military career, serving during World War II. He joined the Navy as a cadet in 1939, and after serving on various ships, he was promoted to the position of lieutenant in July 1942, and in October became first lieutenant of the HMS Walllace on which he was serving at the time. Going on to serve with distinction on several other vessels, Prince Philip's naval career came to an end when the death of his father-in-law, King George VI, was announced in 1952. Prince Philip remains close to every branch of service life, and is said to have been a strong proponent of his children and grandchildren serving.